You will not want to miss this vintage Chevrolet Auction. Everything will sell at No Reserve! Missoula Auction May 11th Montana is more than just a place to enjoy the great outdoors, and Spring is the best time to experience Big Sky Country. **Special pricing for this auction! Spokane, WA - Big Sky Collector Car Auction 2019 May 15th A Wednesday Evening Auction... DAA Northwest's kick off collector car auction at their huge facility in Airway Heights (Spokane, WA). Open to all of Silver's registered bidders. Automotive collectibles - Rare cars - Vintage bicycles - Original pedal cars & More! A superlative collection of desirable and hard-to-find memorabilia, pop culture, nostalgia and vintage; an opportunity you don't want to miss! 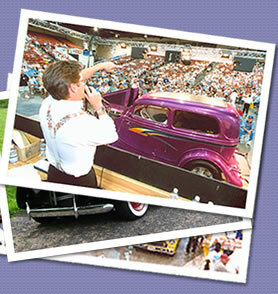 COEUR D'ALENE AUCTION 2019 June 15th Silver's auction is held in conjunction with the Car d'Lane Classic Car Weekend, filled with a car show, swap meet, street dance and cruising of Sherman Avenue right next to the award winning grounds and facilities of the Coeur d'Alene Resort. Jackson Hole Auction 2019 July 6th Immerse yourself in Americana this 4th of July weekend with Fireworks, Rodeos, Classic Cars and street dances, while surrounded by the rugged wild west grandeur of the Teton Mountain Range. SUN VALLEY AUCTION 2019 August 31st-1st, 2019 Nestled in the high Wood River Valley, The Sun Valley Resort frames Silver's Labor Day Weekend car auction perfectly.